Its not just the pups that have doubled in size over the last seven days, Levi (above) and Barry and Joan (below) are almost ready to leave the sanctuary of the stable and head off into the hills. Their tails will be ringed over the next day or so, it makes them jump a bit but they soon forget about it and as they grow their tail drops off. All very painless and it means its easier to keep their backsides clean, a haven for maggots if they get too messy. Ivor, Levi and Barry have no idea how lucky they are, not only are we not going to eat them they are going to keep their important bits so we can sell them on as Pedigree Ryeland Rams. Crispen will hopefully have done enough to ensure the survival of his line. He is getting fatter, still being mugged by Maggie every day but seemingly he is getting inside more calories than he needs once more and putting back on the weight he lost so rapidly early this year. This year we are going to rest our three original ewes, Rita, Roxie and Rosie and only letting Crispen lose on Easter and Springtime. That's the plan. Lets hope the fences and gates can contain the beast. 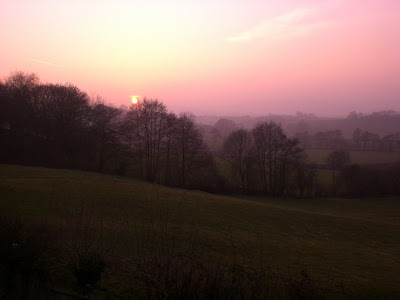 The clocks moving forward helped us out tonight, lots more daylight to aid our chores. Major task tonight was to clean out what was supposed to be the goat dairy but has served so far as a stable, kennel, maternity ward and again tonight as a sick bay. Geisha still has bad feet, we have been treating her for foot rot but to no avail. Current diagnosis from Andy our ever so patient vet is that she has scold, a very nasty form of footrot. She should be better by the weekend, meantime she is making the most of the facilities. 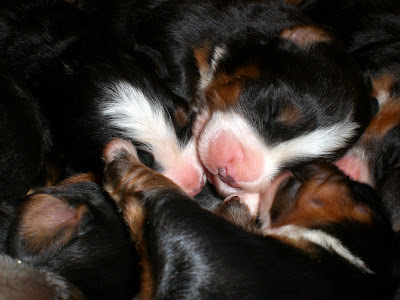 Look how fat these little pups are getting, some of them have put on half their birth body weight in the last five days. Reba may look sweetness and light but she ate the roast dinners of three people today when they weren't looking! She needs the calories obviously! We often get to see Harrier Jets streaking past low level here, sometimes we are higher than the planes. Its quite a thrill. Equally amazing is this little shitland pony, not that you can tell by looking at the photo, he seem innocent enough. 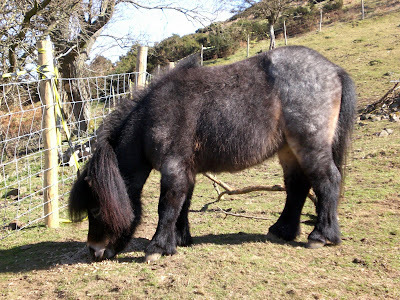 But this is where you would be wrong, this is The Pocket Rocket, our feisty miniature horse called Trevor. Take a moment to look at the picture and note the fence, the fence next to him, the fence that is level with his shoulders, the one that's in effect as tall as he is. He has just jumped it, probably because he thinks the grass is greener this side, more likely so he can bother the other two, William and Apollo. Not an easy jump for a 33 inch high plump pony, especially as his approach was an uphill run. Perhaps the Pocket Rocket has been hiding V.T.O.L ability. Last night was, for the time being, the last night of interrupted sleep at Rock HQ for a while as Easter has finally condescended to give birth. She delivered at 9.10 BST a strapping ram lamb called Ivor, who alongside his cousin Levi will be brought on and sold as pedigree Ryeland rams later in the year, thus ensuring Crispen has done his bit for the Queen and contributed to the gene pool of this ancient breed of sheep. Mind you given the trouble they have caused since their arrival at Rock HQ I can see why they are unpopular amongst mainstream farmers, the single large lamb takes twice as long to mature as commercial stock and giving birth to such large lambs is an eye watering experience to watch so it must be excruciating first hand. No wonder they delayed it for as long as possible! Easter is an extraordinary ewe, she has all the mothering instinct of a Dyson Hoover, which she is ably demonstrating in the clip above. Instead of communicating with Ivor in the low grunt sheep use solely for talking to their lambs Easter is busy stuffing her face with the fresh hay put down to make it cosy for her labour. 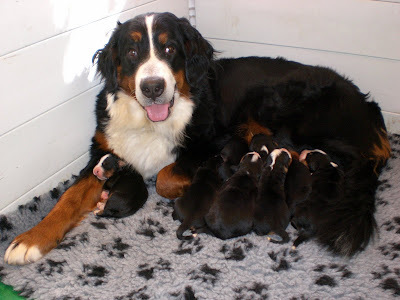 Last year she gave birth to twins, unusual for a Ryeland, and she refused to feed them. We didn't realise this was happening until it was too late so the lambs missed out on the vital colostrum milk feed so one died and the other, Daffodil, now thinks she is a dog after being bottle fed and running with the pack instead of mixing with her own kind. She is the one in the picture a few posts below stealing the biscuits from Poppy. Ivor is doing well despite Easters limitations and we made sure that he had a substantial feed before we left them to it to start the days chores. Spring cleaning! The only drawback of the season as far as I am concerned! The workshop hadn't been touched since last December so was way past a clear out. Pass the broom. The first of the news sheets have gone out to the members of Pig Club, or Grunts as we call them at Rock HQ. There are four memberships, two of which are syndicates and there are two more potential Grunts who are thinking about joining. Membership starts in April and once the Grunts applications are processed they will get two nice pork chops as an introduction to the taste of things to come. I have included a very handy chart so Grunts can see where their meat comes from. The chops come from the middle at the top, or section F to be precise and you can have it cut into tasty chops or left whole as a roast. The syndicates will have to share their free chops but it will be the best morsel of pork ever. This is one of the girls shouting and a waving. 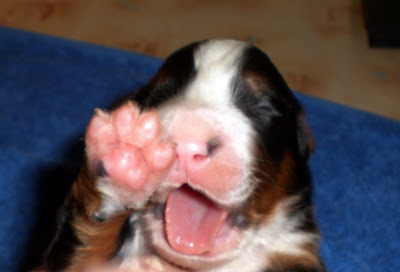 We think she is saying "Hi Elliott!" 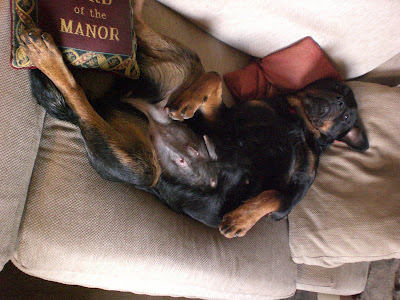 Penny, formerly Finn, the Rotty has only been here a few weeks and really made herself at home, as you can see. She didn't put a paw wrong, in fact she was less trouble than several members of the magnificent seven. 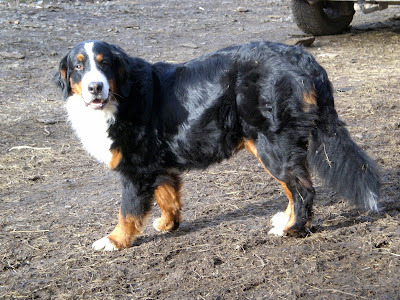 She has changed from a cowering timid dog to a confident and happy hound that loves company. Today she moved out, packed her collar, lead and bowl and met her new family who wanted a second dog to keep their huge German Shepherd cross Golden Retriever company. If you wonder what a dog like that looks like, just like a German Shepherd, massive and the colour and temperament of the Golden Retriever. Gorgeous dog. Anyway Penny and he hit it off straight away. Penny behaved very well, didn't pull her new owners arm off when she took her for a short walk. 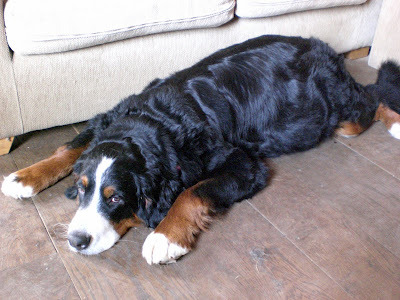 So we said goodbye and handed over the care of this lovely Rotty to a new family. It was surprisingly difficult to say goodbye to Penny, she has learned to trust us and perhaps people again. 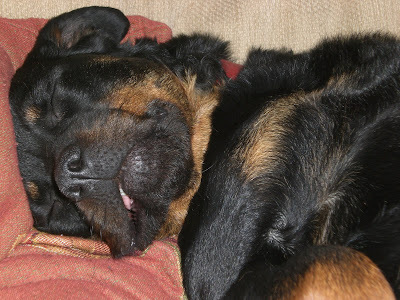 I had great reservations about looking after a Rottweiler, especially as we have so many free range beasts here at Rock HQ but she was great. It just shows you, there is nothing wrong with any dog, its the people that look after them. Good luck to Penny and her new family. This is Ripley. Sound asleep after a traumatic visit to the vet to have her dew claws removed. Not traumatic for her so much as for Tracey and I. Andy the vet did a first class job, as usual and within minutes they had forgotten all about it. 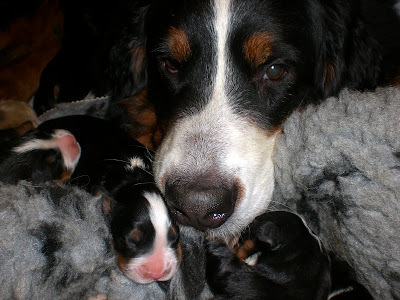 Its still hard to believe that there are now eight little Berners at Rock HQ alongside two very big and very proud Berners. 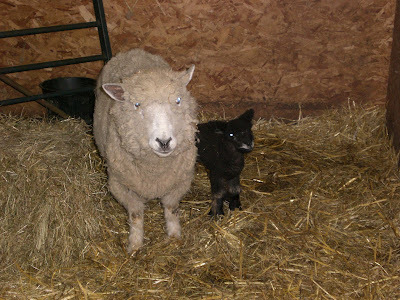 As I was feeding the pigs tonight Rita our best ever Ryeland ewe, best as she is the friendliest and best Mum despite encountering the ugly stick when she was younger, gave birth to Barry, a very healthy ram lamb. Yes that's Barry White, above, and Joan Jet, below, in the same stall at the moment. All our animals have names, it helps identify them in the freezer. Anyway, there is now light at the end of the tunnel now as we only have our biggest, fattest worst mother Ryeland Easter left to give birth and it will all be over for another year. I was beginning to get irrationally cross (caused by our lack of sleep) with the sheep due to their lateness of production of potential lamb chops. 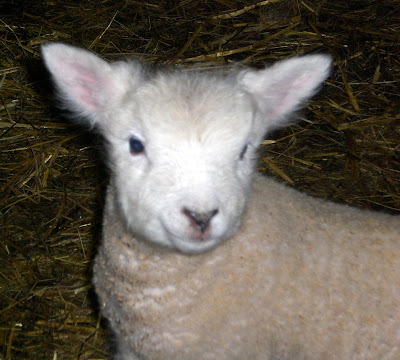 Its goes something like put the ram to the ewe on November 5th and you get lambs April fools day. 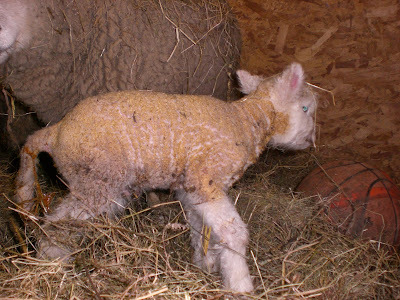 We put ours to the ram a whole month earlier, start of October but nothing arrived on time and Crispen our ram had obviously missed his mark because Meg gave birth 16 days ago so he missed a complete cycle. Lucky hes so good natured otherwise he might have been shepherd's pie the way I have been feeling towards him and his wives. So now we have our goat kids, our puppies and most of our lambs. There is light at the end of the tunnel, and for once its not a freight train! 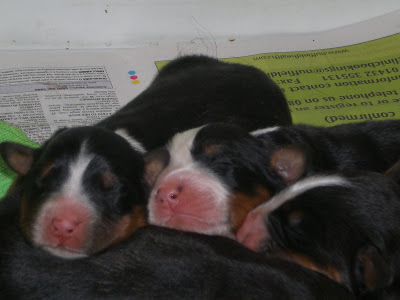 Its going to be a record month for photographs, over 600 this month, but given the subject matter available its hardly surprising, how cute are these puppies! Reba is doing well looking after 8 noisy pups, here she is taking advantage of the fact that they are all asleep by having 40 winks herself. 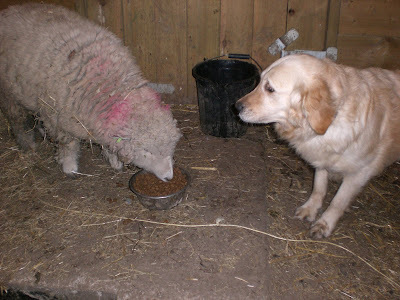 Goes to Poppy our Golden Retriever for gallantly defending her dinner from a rampaging Ryeland called Daffodil. Or did she run away and hide until the nasty big sheep went away? Tonight amongst all the jobs, taking the Technohermit his dinner and showing the Stable Sprite the selection of puppies, Tracey and I found time to give Rosie a helping hand and deliver Joan our latest Ryeland lamb. Rosie was having a spot of bother squeezing Joan out as she was the wrong way around and stuck. Hanging out was one hoof and a bit of tail. Poor Rosie had to put up with the indignity of me fishing around inside her pushing limbs into the right order so she could drop Joan on the straw. Joan is bigger than Levi(short for Leviathan) and a very different colour to Mum and Dad. Rosie hasn't strayed, Crispen, the Dad, carries the coloured gene, so Jet is his and going to be good company for Ebony, our other coloured Ryeland. We are getting a steady stream of visitors to view the new arrivals, when they are as cute as these two its hardly surprising! The Stable Sprite called today and managed to turn his gleaming white chariot around in the yard without demolishing the feed store and breaking any more rear lights. 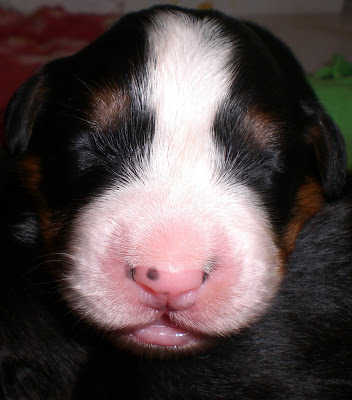 This is Reba, our very clever Bernese Mountain Dog who is managing the shock of having eight puppies to look after very well. Thankfully we were allowed to come home by our very kind boss at lunchtime as Beth phoned to tell us that Reba was giving birth! 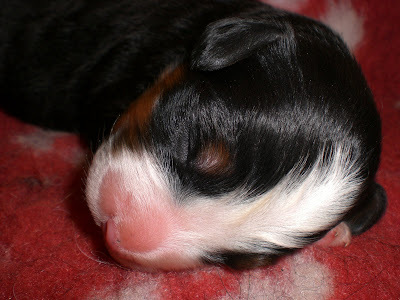 We got home in plenty of time and at 4.50 the first one was born, so far we have six, two boys and four girls! As this video clip was loading another girl was born, we think thats it. 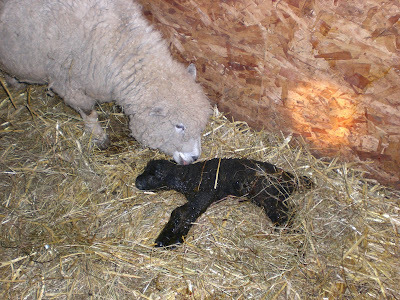 Not to be out done, whilst I was acting as midwife to Reba, Springtime one of our Ryelands delivered Levi, a massive lamb by any standard, thankfully all was well. This is Patches looking delicious, er I mean happy, looking happy in the sunshine. Its Mothering Sunday so as well as thanking our Mums for all they have done for us I thought I would show you all a picture of the Mum to be, Reba, resting today. The bulge is visible and we can feel the puppies moving inside her. 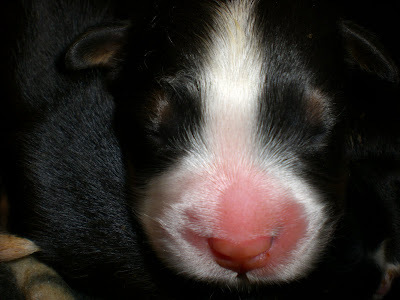 She is due on Thursday, so if she is anything like the sheep at Rock HQ this means we should have puppies by Christmas! Pixie and Patches have taken the news that they are Pork and Bacon respectively very well indeed. Today they removed part of the roof of the chicken house, just for a laugh. They really enjoyed the sunshine, we sprayed them with water when they looked a bit like they were getting sunburn, then they rolled in the dirt and looked like Terra Cotta pigs. We took Mad Keith his present today, it was his birthday yesterday, as we handed over the package he thanked us profusely, it was, he assured us, just what he needed. I asked him how he knew without opening it. He looked thoughtful for a second and smiled saying that whatever it was it was great, he needed it. We left him to his strange and happy world. Time was too precious today to fathom the mind of the technohermit. Kids! Go and play outside! We took the kids out to play. I think they enjoyed themselves! 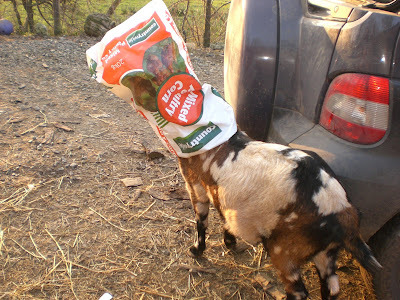 Ladies and Gentlemen, for my next trick, a goat from a sack! If leaning over the stable door staring intently at sheep's naughty bits were an Olympic sport then I surely would be in 2012 team and definitely in the running for a medal. I have even taken to arming myself with a torch which is aimed with uncanny precision as soon the reluctant Mum to be presents a free shot at her bits so I can attempt to gauge when she will finally release my future lamb chops. 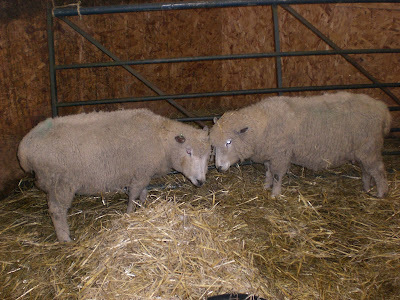 These two fat Ryeland sheep, Rita and Rosie are currently head to head in a race to the finishing line to give birth. I have spent another hour watching intently for signs of life, the lambs inside them are so bored at their confinement they are trying to push their way out in a homage to Ridley Scott's Alien. They are already two weeks overdue and if they don't burst in the next 24 hours they may even continue for another week as the ram will have missed their cycle last autumn. 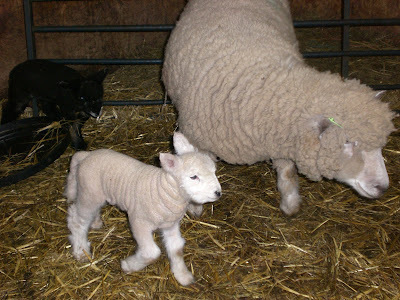 I take heart in the fact that I am not the only one struggling with the timing of lambing this year. One of the first farmers to help us from over Painscastle way is running late and does'nt know why. Like many farming families today his wife works full time off the family farm and he contracts himself out to various bigger farms to supplement their income. Time and timing is an essential element of this sort of life. 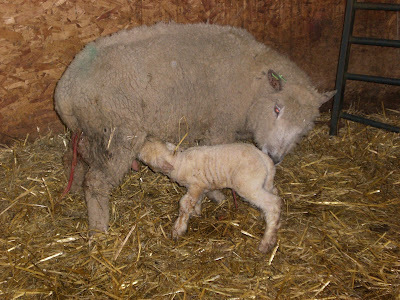 His wife took two weeks off from her job to cover lambing and they only had 12 give birth over that time. Since she went back to work they are having 12 a night! He is the only man I know at the moment who looks more tired than I do. In between pig feeding and watering, taking the bin bags down the lane, posting chickens through the hatch so they could sleep safely, collecting bales for the sheep, goats and horses, feeding and watering said sheep, goats and horses, exercising the dogs, rounding the Muscovy ducks and Sally goose up and putting them away, taking the Technohermit his dinner, it was nice just to take time out and watch this sun set. A few years ago, in a time we refer to as BS, Before Smallholding, we went to the Greek Island of Santorini for two weeks. 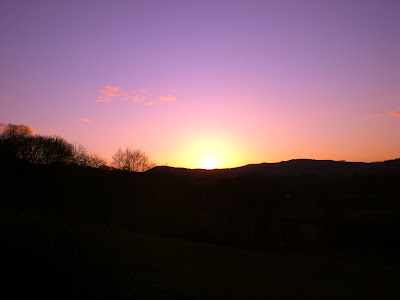 One of its unique selling points was its famous sunsets, said the be the best in the world. Clearly the Greeks are mistaken. Carlsberg couldn't make better ones! 101 uses for an Rx4, 59 Mobile Disco, 78 delivery van and 24 fast food venue. Keeping a watchful eye on the Technohermit now includes helping out with the odd errand, and he has just given us a very odd errand. We are quite used to getting phone calls at strange times now asking us if we are going into town, could we bring him a bag of spuds. This involves further conversations about size of bag, location in shop, price, who planted them, where they were in the row and other seemingly banal detail that is lost on yours truly but of great significance to the Hermit who ruthlessly interrogates me when I deliver the spuds. None have ever been rejected but many have had the exhalation of disdain when, under cross examination, he discovers they are correct in every detail except for number of eyes. We also fetch coal for him and even been entrusted to get him a gallon of petrol. I think he likes the twice weekly contact as I take him his dinner and he really likes being able to phone for help. He did this the other night, the poor chap had really hurt his back moving a battery. I have since seen the battery and where the Technohermit acquired a battery that size is a bit of a mystery. The Americans were stationed on the hill next to ours during WW2 and the battery looks suspiciously like it came off one of their tanks. Anyway the geriatric hermit had tried to move it and seized up. This meant he couldn't ride the four miles to town to fetch his baked beans. Never fear, Rene's here and soon Hermit and Beans were united. I took him his dinner and we had the usual pleasant conversation about the weather, space stations and his bad feet, all spiced with ooohs and ahhhs caused by his bad back. I asked him if there was anything he needed from town. There was something. He had a watch. A very special and valuable watch that needed a jeweler to look at it as it had stopped. I was intrigued, of course I would take it to be looked at. He made me turn around while he went to fetch it from its secret place. As I turned back in the darkness I saw the flash of metal as he told me to be careful with it, it was valuable, worth a lot. He handed it over with a whole five pounds to offer the nice jeweler man to have a look at his worldly good. I took the watch and even in the dark I knew one thing about it. Weightier items have fallen out of crackers. I wait with interest to see the reaction of the jeweller when I take it in tomorrow. 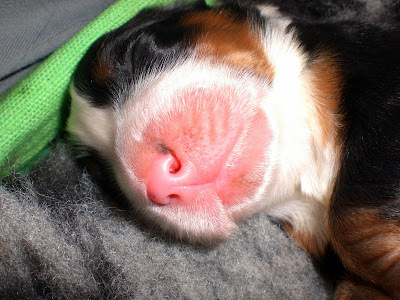 see http://www.herefordtimes.com/news/blogs/4207611.Animals_/ for a different tale. Hopeful contenders of Pig Club begin their auditions! 101 uses for a Rx4 continues, today use 46. A chicken coup. 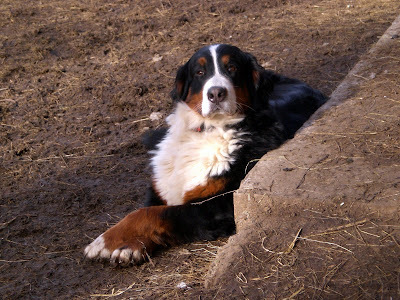 Reba looking very relaxed and regal lay in the sun at Rock HQ next to the step to nowhere, she really is a stunning Bernese Mountain Dog and is now 7 weeks pregnant. 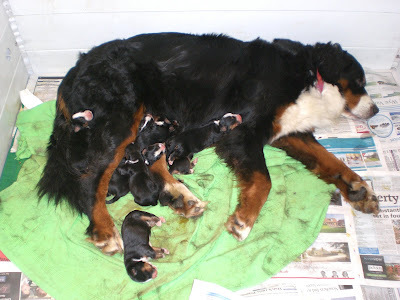 Looking a bit big around the middle, we have no idea how many pups she will have. 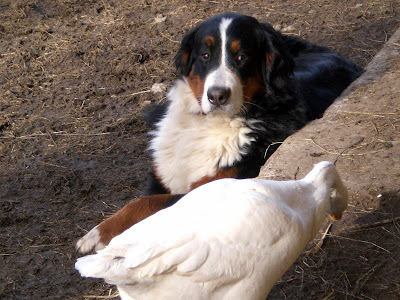 Not quite so relaxed when Sally the Chinese Goose makes a bid for the sunbeam, the goose won. Trevor trying out his sick bed, he's doing fine, soon be back to his full speed biting self. I decided to put this nice picture of Apollo on today's episode to distract me from the sad event of the day. Its been a productive day, Tracey and I worked most of the day on the chicken run, its not the neatest but its seven foot high all round and looks secure enough so hopefully will deter the fox. We are also going to put some aeriel wires over the top as we are not convinced that the ever growing numbers of birds of prey are not helping themselves to a nice chicken dinner when the mood takes them. A few old heavy metal Cd's hanging from the wires might baffle the hovering Red Kites or Buzzards until they spot an easier meal. 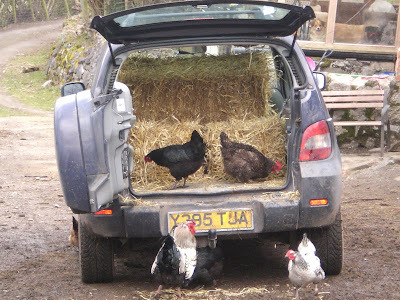 Tomorrow we are collecting 20 hens, which given the price must lay golden eggs so this is an investment we need to protect as they are to feed us not the local wildlife. Actually as I sit and type this my throbbing shin reminds me that I should get the ice pack out. I had one of "those" moments that only I seem to have and seem to have them with monotonous regularity. Hitting a fence post with the sledge hammer all was well until the post split down the middle allowing the 17 pound hammer to continue its arc until it impacted with my right shin. Only for the fact it glanced off a bale of straw and slowed down a tad was I saved from serious injury. Tracey watched with interest as I leapt around the chicken run having missed seeing the hammer blow. 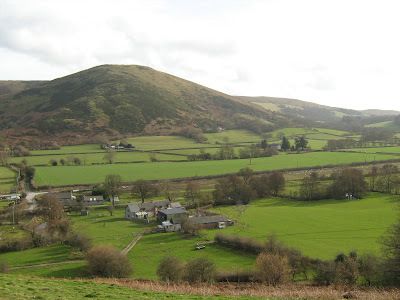 Between leaps and bounds I managed to explain through clenched teeth enough of what happened to satisfy her that I didn't need sectioning under the mental health act, hadn't taken up Morris Dancing and was in fact just being a baby. I am not the only one with a sore leg, Trevor the Pocket Rocket is temporarily grounded as he has strained his front leg, much to his annoyance he is back in the slammer until he mends. 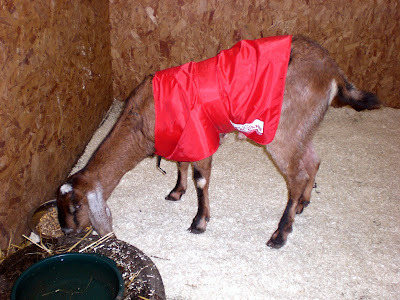 Geisha has also joined in with the oooh my poor leg games at Rock HQ and has sat in the goat house with the return of her foot rot so she has been dosed with anti biotic and had her feet washed in anti septic. But all of this is not what is sad about Rock HQ today. Today we saw Midas had got out of his pen from Meg and was rushing around the stable with the other Mums to be like a mad thing. 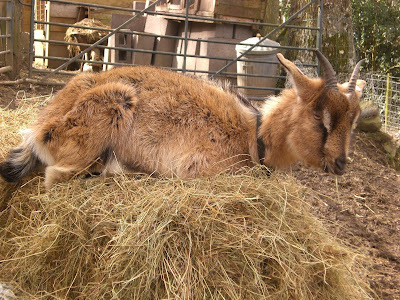 He was jumping up onto a bale of hay playing King of the Castle, like they do, a picture of health. What we didn't foresee, much like the fence post splitting, was by standing on the bale he could reach up to a piece of the baler twine that's so useful and serves so many purposes, in this case keeping the gate shut. 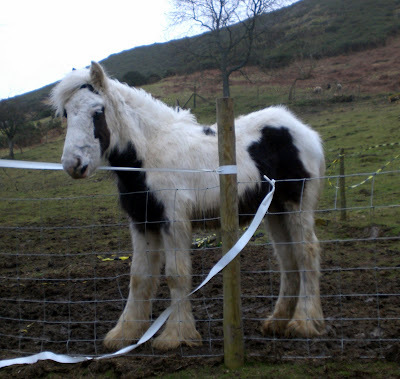 He stuck his head through it, slipped off the bale and unable to lift his head out of the loop hung himself. We found him just as it was too late. Look at the horse and think good things. Pixie has disobeyed the orders from Berkshire Pig High Command and tunneled out by herself. As she is only two thirds the size of Patches she was able to break out and spend a very happy half hour on what we euphemistically refer to as "the lawn". Pet status has been revoked until she redeems herself! Today I achieved a long held ambition, well an ambition held since we moved to Rock HQ anyway. We are surrounded by the most amazing scenery and today I walked to our horizon and looked back. It goes without saying that I am dog tired right now after some 20 miles in seven hours, five of which were in horrible weather, the majority of which was across country. 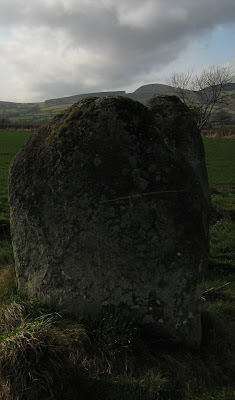 But Sara and I did it and found the standing stones that are only four miles from Rock HQ but have been particularly hard to find as they are situated right next to a main road and clearly visible for miles. How I managed to miss these for the last two years is beyond me and provided a great source of amusement to my walking buddy. 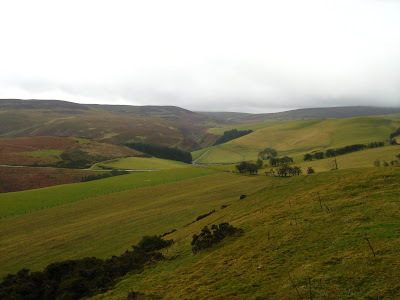 Why did we do this walk today, well its part of a strict training schedule to prepare ourselves for a 178 mile walk in June which we hope to complete in seven days or less. Sara is like the Duracell bunny on acid, totally unstoppable and extremely fit. I used to be able to keep up but as I have fallen victim to middle age spread I struggle to keep to the pace. 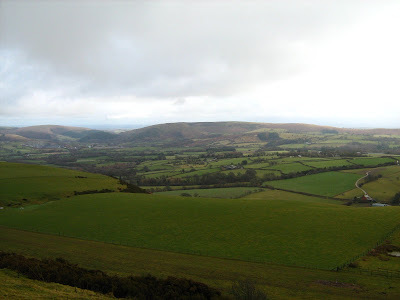 The walk is named The Great To Do, or The Offas Dyke Ordeal. Chepstow to Prestatyn via Rock HQ which lies almost on the path around the mid point. I am doing it to raise money for Prostate Cancer Charities. How we fare, well watch this space!